Today I have an interview with John Heldt, author of two books: The Mine and The Journey. I did surprisingly little. I attended high school in eastern Oregon in the late 1970s, so the particulars of that place and time were familiar to me. When I wrote The Mine, I had to do a crash course on 1941. I had to familiarize myself with the music, fashions, and speech of the time, in addition to news events, customs, and business practices. I didn’t have to go to those lengths when writing The Journey, but I did do some research. I perused old newspapers to reacquaint myself with the prices of consumer goods – gas was 86 cents a gallon in 1979 – and the particulars of everything from the Iranian hostage crisis to the eruption of Mount St. Helens. I also listened to a lot of music from late 1970s. The only way to write an authentic account of a particular era, in my opinion, is to immerse yourself in that era. What are your thoughts on e-books? As a reader, I still prefer paper books. They are user-friendly and don’t require a power source unless you try to read them in the dark. As an author, however, I have come to love and appreciate e-books. I can create and distribute my novels far more easily and cheaply and reach new audiences more quickly. Electronic books will never entirely replace paper books, but they are definitely the wave of the future. I think that’s a good thing – both for readers and for authors. I try to learn from them and keep in mind that readers are consumers who are evaluating a product, not passing judgment on a person. What I have found is that it is virtually impossible to please everyone, but it is very possible to learn from mistakes that readers point out and apply that knowledge to the next project. I had total control over the cover design, but credit for the compelling cover image must go to the photographer who uploaded it to a stock photo site. 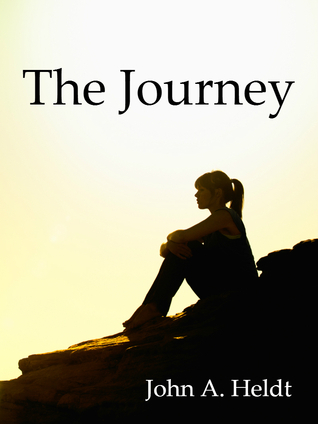 I had a difficult time deciding on a cover for The Journey. For weeks, I considered an image of an empty rural highway that disappeared into the horizon. It perfectly illustrated the concept of a journey, but it did not capture the spirit of my novel, which is mostly a story where two women come to grips with their present and their future. Then I stumbled upon this photo of a young woman, a pony-tailed brunette, who appears to be deep in thought as she sits on a rock at sunset. My young protagonist, Shelly Preston, is a pony-tailed brunette who does a lot of thinking and reflecting as she navigates her way thought her difficult senior year of high school. I could not have asked for a better photo if I had commissioned it. It was perfect. If there is a message to The Journey, it’s that it is never too late to change your life and positively influence the people and institutions around you. Michelle Richardson, the novel’s older protagonist and time traveler, is given a unique opportunity to remake the world of her youth and she makes the most of it. John A. Heldt is a reference librarian who lives and works in Montana. The former award-winning sportswriter and newspaper editor has loved reading and writing since writing book reports on baseball heroes in grade school. A graduate of both the University of Oregon and University of Iowa, he is an avid fisherman, sports fan, home brewer, and reader of thrillers and historical fiction. Heldt is the author of THE MINE and THE JOURNEY.